Office Cleaning | Ashford Cleaning Contractors Ltd.
At Ashford Cleaning Contractors Limited we provide complete office cleaning service to our commercial clients. Our flexible approach is tailored to meet your requirements with a service that is efficient and cost effective. 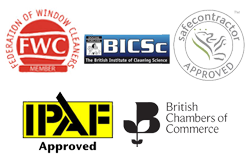 To ensure the highest quality of service all our staff, whether managers, supervisors or cleaning operatives, are fully trained to the British Institute of Cleaning Science standard. Our management team closely monitors all office cleaning, so you receive a continuity of service and a high level of support.